Learn more about Roulette variations! After studying the following tips, any player can display his mastery in playing baccarat. It is the easiest as well as one of the most visible and glamorous casino games to play. Let’s consider 10 tips in playing Baccarat a bit in detail. The first rule for gambling, and the most essential Baccarat tip is to never play with money the player cannot afford himself to lose. It is wiser to play with some spare money. In general, use money that is available at the moment, but not money that is needed in future for paying bills. 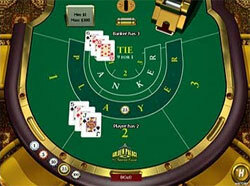 While playing American Baccarat, ignore any attempts of helping to develop the strategy. The matter is that in this game the player can rely only on luck’s mercy. The game is restricted by rules that allow no additional choices. The good thing is that the house has little advantage in comparison with other best online casino games. Mind that! The most attractive bet is the bet on the banker. The choices are limited to the three, so if the player simply wants to avoid the wager with worst odds, it is not advisable to bet on tie. It is important to know that one of the most legitimate rules in Baccarat playing is that the odds will either improve or make worse the bet if the game is played with less than 8 decks. In 1 deck game, for instance, the house advantage of the casino on the bet is dropped slightly, the house advantage on the bet on the player raises slightly and the advantage of the house on the bet on tie raises up dramatically. In European game, the player can use the “Avant Dernier” system that means in French “before last.” And that exactly explains the strategy. While betting on the hand, it is advisable to go back to the winner of this hand before the last and wager on this winner, which can be either player or banker. In case with Martingale negative progression system, it will probably leave the player broken for a long period of game, however, it can be applied during the medium-long period. The most optimistic hints of playing Baccarat favor the positive progression systems to win the money. Every time the player wins the hand, he must increase the amount of the bet by 50 per cent in the next hand. If the player loses, he must go back to the standard wager unit. One more legitimate tip is look for the Baccarat game, where the house’s charge is less for the privilege of the Baccarat playing. The standard fee is usually 5 per cent. However, the player may find the playing hall with fees of 2, 75 per cent. We offer the effective and modern information services to all customers according to their tastes about the modern gaming world and its significance in the sphere of online gambling. You can contact us by this E-mail form. Online casino guide takes care of each customer and offers the maximum interesting and up to date informative web page dedicated to the gaming industry and its latest tendencies. Copyright © 2019 CasinoGuideline.com. All Rights Reserved.